November marked the unofficial start to the 2007 season as many corps hosted the first of their annual auditions. DCI.org has asked directors and staff members for their tips to help you on your way to becoming a member of the world's most elite and exclusive marching music ensembles. Many corps still have opportunities for auditions in December. 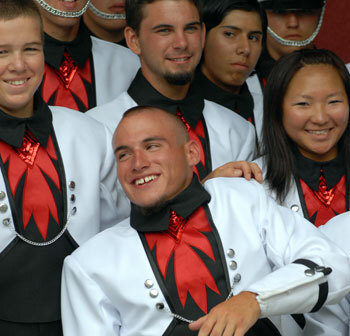 Visit your favorite corps' Web sites to find their most complete and up-to-date audition information. Practice hard and good luck! Dutch Boy; Aug. 10, 2006; Madison, Wis.
Don't be afraid to meet and converse with the people around you. If it helps you feel more comfortable, look for those around you who might feel the same as you. Everyone auditions, but not everyone always feels the need to talk. Don't let anything blow your confidence. Just be yourself and show what you know! - Scott Chandler, Blue Devils program coordinator/choreographer Check out a list of audition dates for the corps you want to join.